I had no classical flute background, and she put me right to work, with a lot of focus on breathing, facility and tone. She isn’t afraid to make her students work hard, and that was exactly what I needed. Jennifer is a phenomenal player and teacher, and she propelled my own musical career forward in a deep and meaningful way…I would love to take lessons from her again. Most importantly, flute instruction is meant to foster a positive learning environment that engages the body, mind, and soul. Learning correct technique and having professional expertise are invaluable tools for enriching a musical experience, no matter your playing goals. 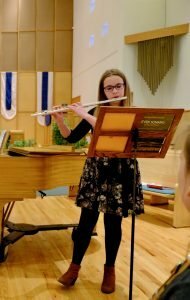 The flute is a great instrument to learn from a young age; children 5 years and older can start playing the flute, and there are different ergonomic options for any sized child (including Nuvo flutes, curved headjoints, lighter options, and full sized flutes). 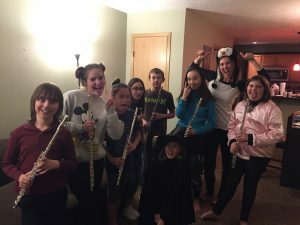 Children and teenagers looking to take flute lessons are usually interested in improving at a faster rate than their school ensemble can provide. 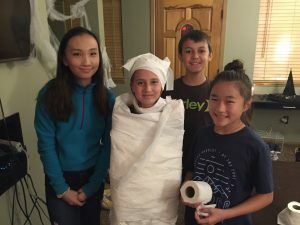 They are either looking to supplement current school instruction or–in the case of homeschool or private schools without music ensembles–provide primary music instruction. Other children are looking to get a head start before the age of 9-10, which is when many students start music in school. Those in middle or high school looking to audition for regional/state honor bands or orchestras as well as those looking to pursue music after high school in some way also seek lessons to hone their skills and improve their playing. Lessons occur weekly for 30, 45, or 60 minutes. The length of lesson is determined by playing level and goals. A free trial lesson is offered and recommended before enrolling to ensure the teacher-student relationship is a good fit. Learning the flute can happen at any age, and lessons are a great way to enrich your love for music. 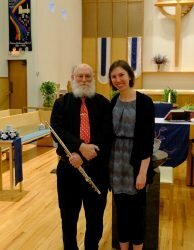 Adults looking to take flute lessons are generally interested in playing music for enjoyment and playing pieces they want to learn (not necessarily the rigorous pieces required for serious, conservatory-bound students). You get to work at your own pace for your own tailor-made goals. The purpose of lessons is to determine weaknesses in playing and transform them into strengths. Sharing music with others is the primary goal, and learning to play the flute at a higher level will only enhance your musical life.